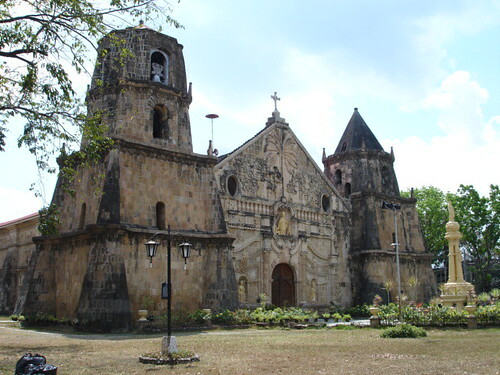 In 1993, Miagao church was included in UNESCO’s World Heritage List under the title “Baroque churches of the Philippines.” The town was a visita of Oton until 1580, then annexed to Tigbauan until 1592, to San Joaquin until 1703, Guimbal until 1731 when it was raised to an independent parish. However, it was only 1734 that Miagao had a resident priest, Fr. Fernando Camporredondo. The original town site was by the sea in a place called Ubos (Hiligaynon for lower place). A church and other structures were built around 1734 but in 1741 the church was burnt during a slave raid. Fr. Camporredendo who ministered in Miagao from 1734-37, 44-50 built a second church during his second term. This lasted a handful of years because in 1754, the town was looted and burnt during another raid. Because of its vulnerability to raids, the Augustinians transferred the town up a hill called Tacas. There Fr. Francisco Mayo began building the present church in the year 1786. The structure was completed in 1797. Stones were quarried from San Joaquin and Igbaras. Fr. Francisco Perez added a story to the left tower in 1839. In 1864, Fr. Agustín Escudero restored the church. In 1880 Fr. José Sacristán decorated the interior. Early in the 20th century, the church was burnt during the Philippine American war and used as headquarters and barracks during World War II. The interior of the church was greatly damaged. In 1948, 1959, and in the 1970 the church was restored. Restoration is an ongoing concern as the soft yellow sandstone used in the church erodes easily. Heritage Features: The flanking towers, massive, and of unequal height gives Miagao the shape of a fortress. However, the finely carved tassels, dangling like fringes from the second and third stories soften the military appearance of the construction. It is the ornamentation of the church that gives it distinction, this is especially true of the façade which designed like a retablo. Above the portal is a niche containing the patronal saint, Santo Tomás. From the niche runs horizontally a band of dentils and rosettes supporting a blind balustrade. The niche is linked to the first story by engaged columns supporting a plinth. These columns which flank the main arch portal are linked to two other columns by downward curved lines. Between the pair of columns are niches with saints. Rococo embellishments ornament the portal and the sides of the outer columns. The pediment is an altogether independent composition. The giant San Cristobal, who ferried people across the river is shown with the Christ child resting on his shoulder. The giant, dressed in breeches, supports himself with a coconut tree, rather than a staff as is traditional. Tropical plants like the papaya and others in vases are arranged in a symmetrical composition around the central figure. The pediment is pierced by oval windows seemingly out of place in the busy composition. All told the façade is a mixture of decorative styles–Classical, Baroque, Rococo–all linked by tropical fantasy in a design uniquely Philippine. For this synthesis and reinterpretation of foreign influences, Miagao church is called a World Heritage Site. Miagao has a 19th century cemetery worth visiting. A watchtower is found along the shore. 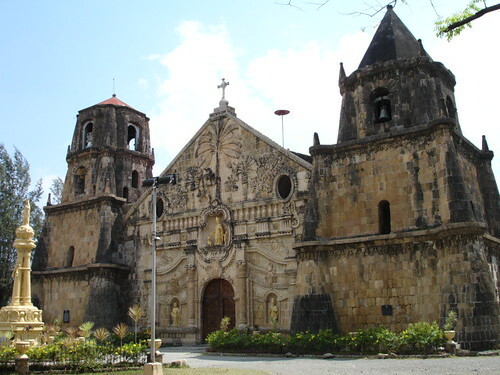 This entry was posted on July 27, 2006 at 11:02 am	and is filed under Churches, Iloilo, National Historical Landmarks, UNESCO World Heritage Sites. You can follow any responses to this entry through the RSS 2.0 feed. You can leave a response, or trackback from your own site. this is really great! I am a miagawanon. i hope you can still feature on how miagawanons celebrate the feast or the fiesta. Pls i need to know the contact number/s of Miag-ao Church and the name of the Parish Priest assigned to the church. Thanks.